TEN boxsets to one lucky reader! 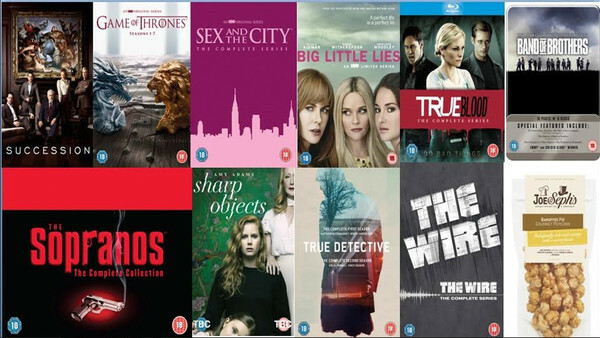 Everyone should have at least some HBO boxsets in their collection: if a show comes with that label, you know for a fact you're assured of a higher level of quality as a bare minimum. Just in time for Christmas, we're teaming up with HBO to give one lucky WhatCulture reader the chance to win a mega bundle of some of the premium TV studio's best shows on Blu-Ray and DVD. We're giving the winner of this incredible competition a bundle including Game Of Thrones' new 4K boxset, The Wire, Succession and new shopw Sharp Objects as well as classics like Band Of Brothers and True Blood. It's not one anyone should miss out on. And as an added bonus, we're throwing in some delicious gourmet popcorn from Joe And Seph. To be in with a chance of winning, simply submit your name and address details to contest@whatculture.com, remembering to quote 'HBO Bundle' in the subject line.